The Best SUPERCHARGED BIG BLOCK C10 That You Will See All Week!! Take a look at this, The Best SUPERCHARGED BIG BLOCK C10 That You Will See All Week!! Granted the tittle might sound a bit over achieving however bear with us, we think that we might be right because this time we are bringing you a very cool fabrication. This is a C10 which basically has no part of it left unchanged and not in a bad way at all, because whichever point you look at this from, this thing it looks gorgeous and maybe even better on a second look. The engine compartment has been upgraded by Vortex supercharger so now that 502 will provide a very decent mile to the gallon number, while at the same time, it is capable of blowing the doors of the truck at will. The interior is something to be desired whenever you decide to build a C10 truck, and it should be remembered just in case you are capable of doing it. So check out this great C10 and let the guys tell you more about it in the video. Daddy Dave in a Small Tire Truck vs Flaco at Armageddon No Prep! 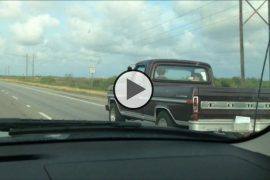 Sleeper 1970 F-100 Embarrasses Tuned 2011 Silverado! Stunning 1200 HP 1965 Chevy C10 Restomod Build – Rat Rod Pickup Truck!! 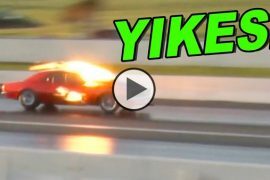 Previous articleChevy Truck Challenges Lamborghini To Race, Surprises Everyone!! !